The first time a ship of Viking Ocean Cruises visited The Netherlands was at the 25th and 26th of april of 2017 during an overnight stay. 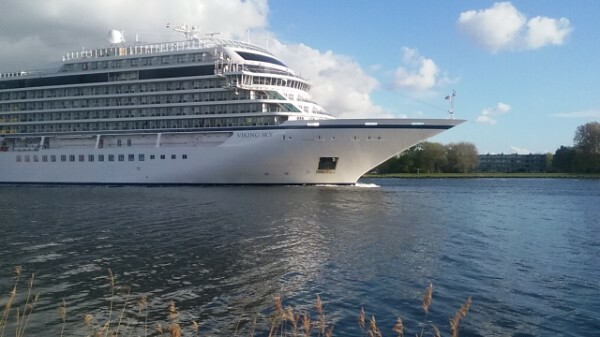 The honour went to Viking Sky and she is seen here passing Velsen Noord at the 26th. In the 1970's and 1980's, when cruising started to boom, many lines concentrated on the seven-day 'milkruns' in the Caribbean from Florida, that saw a huge growth in tourism at the time. But in 1969, a newly formed line with Norwegian origin had been based on a very different principle. The company was named Royal Viking Line, headed by Torstein Hagen and they concentrated on worldwide, longer cruises in luxurious style. For this, they built three 22.000-ton ships named Royal Viking Star, Royal Viking Sky and Royal Viking Sea. The line was bought by Kloster Cruise (Norwegian Caribbean Lines) in 1988 and from the early 1990's onwards the ships were placed in other fleets. Under the Royal Viking Line name, two new ships operated untill 1994 when the line met it's end and was absorbed into Cunard Line. Mister Hagen had become involved in Kloster Cruise as well as Holland America Line, but in 1997 he founded his own line again. This time a company in rivercruising under the banner of Viking Cruises. Quickly, the company became the largest operator of such ships in the world, sailing in semi-luxurious informal style based on Scandinavian quality. 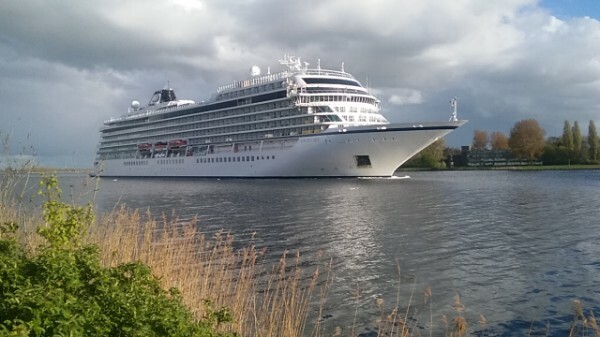 And again the sea pulled at mister Hagen too, as in 2012 a new arm of the company was formed, Viking Ocean Cruises. With a nostalgic look backwards, the first trio of ships were ordered and entering service under the names of Viking Star, Viking Sky and Viking Sea. Although it is not a revived Royal Viking Line, all is done to at least link to this classic company. Now sailing under the name of Boudicca for Fred. Olsen Cruise Lines, the former Royal Viking Sky of course is the true name-giver to the Viking Sky. In july of 2012, the order for the first two ships was placed with Fincantieri by Viking Cruises and with this, the company expanded officially from it's river-cruising origins into oceancruising. Viking Star, the first ship, was launched in june of 2014 and she entered service in april 2015. The second and later ordered thirth ship were both to be delivered throughout 2016, but in fact only the second ship Viking Sea was. This was because of the building of Holland America Line's newest ship, the 99.500-ton Koningsdam that was built at the same yards and her launch was prioritized. So Viking Ocean's thirth ship Viking Sky was delayed by several months and finally launched at the 23rd of march 2016 and she was not completed untill january 26th, 2017. Her maiden voyage started on the 25th of february of that same year and took her into the Mediterranean from Civitavecchia (Rome). The ship measures 227,20 meters in lenght, is 28,80 meters wide and she has a draft of 6,30 meters. Her tonnage is measured at 47.842, making her quite small for todays standards. Aboard, she has fourteen decks of which nine are to be used by the passengers. Their number is 930 and they can sleep in 465 cabins. Co-incidently, the number of crew aboard is equal to that of the number of cabins, 465. Driven by two 12-cylinder and two 9-cylinder diesel engines that were designed by MAN, her normal cruisingspeed is 20 knots and she is propelled by two screws instead of the more commonly used podsystems. The ship has been built at the Ancona yards of Fincantieri in Italy under yardnumber 6237. The ships of Viking Ocean cruises are registered in Norway and their homeport is Bergen. As was expected, the Viking oceansisters are designed like luxury boutique-hotels in a very open, Scandinavian style making use of lots of glass, clean lines, blonde woods and stylish cushions and throws. The interiour design was overseen by the London based SMC Design and the Los Angeles based Rottet Studios. Designers to the likes of Frank Gehry and Mario Bellini also give hints of top-designed furniture for maximal comfort. Classy leather furniture is there in her lounges, just as long couches and deeply padded chairs and tables so the lounges are really made for relaxation. There is also a unique art collection aboard inspired partially by Viking Cruises itself. This art-collection includes specially designed ceramics and is made by mostly renown and upcoming Norwegian artists. There is no casino aboard (at none of the Viking Ocean Cruises ships there is) and no dedicated kids program as the ships are only for 16 years and older. But there are of course several lounges and bars, all in luxury style and light colours, and for the sportive passngers there are two swimmingpools and six jacuzzi's. WIFI aboard is free and unlimited, speciality dining is included just like several excursions and enrichment lectures like we also find them aboard expeditionships. Like Hagen seems to say as a motto for his ships; 'it is a thinking man's cruise, not a drinking man's cruise'... That said, beer and wine are free also during diner, as is the use of the self-service laundry. The sharp tip on her longer foredeck can clearly be spotted here. The comparissement between the new Viking Ocean ships and the former Royal Viking Line ships is easily made. Also, the blue line on the hull was a signature from the Royal Viking Line. Cabins are all at least 270 square feet, making them quite big and all feature balconies (as there are no inside cabins), a king-size bed, comfortable seatingarea, a 42-inch flatscreen LCD TV and heated floors in the bathroom. There is also complimentary 24 hour room service available. Viking Sky and her sisters are very similar in design, but of course small alterations were made to Viking Sky as time progressed. The outdoor area on the back at deck 2 for example was an extention of the restaurant aboard Viking Star and Viking Sea, but in Viking Sky it is more like an outdoor lounging space as passengers didn't used the area for dining anyway. Also the owners suite on Viking Sky is more light in tone, due to the use of bleached-wood walls instead of the darker woods used on the earlier ships. It is said that Hagen himself insisted in this change, and he was inspired by his own new apartment at the Oslo waterfront. Also the ships gym is 50 square meters larger then aboard her earlier sisters and the colouring used in the topsuites is also lighter. The Explorers Bar has been renamed as Paps, honouring the father of Thorstein Hagen. Here, passengers can now nip on a signature brandy that Hagens father really loved. The ship offers fifteen dining options that include The Restaurant, The World Cafe, Viking Deli, The Chef's Table, an Italian Grill and The Kitchen Table, next to several outside dining options, casual cafe's and pool grills. A piano in the middle of the three-deck atrium is regularly used for classic performances and other entertainment include the Star Theater, an onboard cooking school, the Viking Piano Bar and a wintergarden. of course there are also shops, a library, a few cinema rooms and a relaxing Spa with multiple treatment rooms and an outdoor gym. The hull of the ship is designed with sleek lines and it is hydrodynamicly optimized so water can flow freely saving costs and use in fuel. As environmentfriendlyness becomes the norm, her engines are very energysufficient and exhaust gas cleaning systems are built in to minimize harmfull emissions. Also, solarpanels are placed at the retractable roof above one of the swimmingpools to further lower harmfull exhausts. 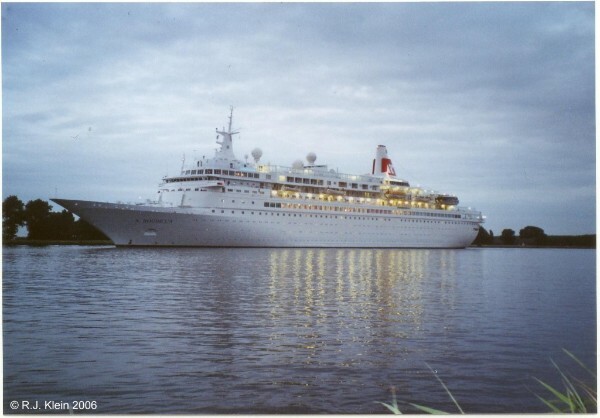 What is equal to the old Royal Viking Line, the ships do have longer portstays and a very wide range of cruises, not being stuck in a simple seven-day cycle. They really roam the oceans. The first voyage of Viking Sky started at the 25th of february 2017 in Civitavecchia in Italy and took her into the western Mediterranean to Tunesia, France and Spain, ending in Valencia. Afterwards, she started to climb up the European coast northbound. With more ships arriving the coming years it isn't hard to understand that the roaming ships of this new company will be seen across the world to show off their Scandinavian splendour. On june the 22nd, the Viking Sky was officially christened in Tromso, Norway. The ship was blessed by the cutting of a rope holding a bottle of Gammel Opland Aquavit, instead of champagne. Why use French things on such a Norwegian occation... The rope of course was split by a gilded Viking axe... Besides, Gammel Opland was the favorite brand of Torstein Hagen's mother, nicknamed Mamsen, not very co-incidentally also the name of the ships Norwegian deli. Marit Barstad is the ships' godmother, and she is the sister of Torstein. During the ceremony, onlookers were pleased by a large concert by several Norwegian artists to the likes of the Arctic Philharmonic, Lisa Stokke, Violet Road, Sara Marielle Gaup Beasca and Jorn Hoel. At the end of her first summer, Viking Sky started crossing the Atlantic to spent her wintermonths in the sunny Caribbean, before returning to Europe for the 2018 summer. 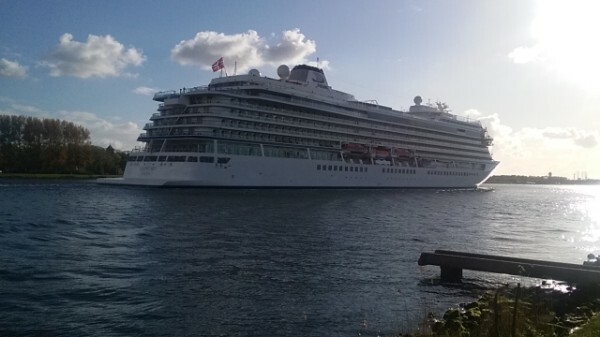 At the 23rd of march in 2019, Viking Sky came into deep trouble nearby the Norwegian town of More og Romsdal during a Norwegian cruise when her engines had failed on her. In a vicious spring storm off the coast she was a playtoy for the huge waves and she drifted towards the shore. The coastguard started to evacuate all 1300 people on board by helicopter, which again was a very hazardous undertaking. Luckily, one engine was able to be restarted the same evening and at that time, some 460 people had been lifted off the ship, of whom three were seriously injured and brough over to hospitals. The ship then was able to sail under her own power to the town of Molde. One cargoship that had assisted in the rescue had also come into trouble itself and its nine sailors were evacuated also. It was later reported that low oil pressure was the cause of the incident and Viking Sky was permitted to sail for Kristiansund for repairs two days later.